✅ Trip Verified | I loved the flight and service, the crew was very helpful and friendly. Found the seats comfy and because of the low fares we booked make this trip to Iceland. Thank you WOW air.We will miss you. "will never fly WOW air again"
✅ Trip Verified | Detroit to London via Keflavik. Absolutely awful. Cancels flights, delayed flights, atrocious customer service. Every single thing about this experience was awful. I will never fly WOW air again. ✅ Trip Verified | Worst airline ever. DO NOT use this airline. It's not worth the reduced airfare at all. When we arrived at the airport for departure we were told we'd have to pay extra to sit together, that cost $88.00. Then we were charged $70 baggage, on top of the $140 we had already paid for baggage. On the return flight, they charged us $120 for carry-on's that were not charged on the departure flight, these carry-ons were a backpack and a purse. How can a backpack and a purse not be considered a free carry-on? There was no sizer or weight scale on the return trip, the ticket agent was just plain rude and said if we didn't pay for the carry-on's we could leave them in the airport! Tried dealing with customer service when we returned home for a refund of this nonsensical carry-on charge and it's just dealing with one incompetent after another. They did no investigation, just said whatever their ticket agents say, goes. Another issue that we witnessed on the flight home was that of another customer. In mid air a rude flight attendant grabbed a woman's coat from the overhead so harshly that she ripped the woman's coat, leaving a large tear. The flight attendant was not apologetic and when the customer simply stated all she wanted was an apology the flight attendant began yelling at her. Absolutely ridiculous treatment of a customer. Please save yourself the hassle, don't fly this airline. ✅ Trip Verified | I've flown with them a few times and they've been great. However, this time around, I'm not so happy. I woke up at 6am, to an email saying my flight was canceled; my flight home was set to leave at 1035am. I call them and apparently the next flight out is in 2 days! They gave me no compensation, no help, nothing. I'm scrambling to get people to cover my shift because I'm set to work the next day. Absolute nightmare. ✅ Trip Verified | Toronto to Paris via Reykjavik with WOW air. The plane was smaller than any trans Atlantic flight that I had flown in the past but the boarding process was so smooth. Although food is available for sale, the crew were very friendly. ✅ Trip Verified | After reading lots of reviews I was really sceptical about flying with WOW air. I still went ahead and booked my ticket to detroit as it was the cheapest option for a one way, and I had to book last minute which is always more expensive! I decided to pay for selected seats up the front with extra leg room on both flights and got really lucky with having no one in my row for the first flight. The second flight I chose a seat with no middle seat and was really happy with this decision. As it’s a cheap airline a lot of people do not pay for the seat upgrade, it’s really not expensive to purchase the extra leg room and well worth it for the comfort! Plus you will likely not have many people around. The food and drink on board is very expensive, but as I knew this beforehand I purchased food and water at the airport to take on the flight with me. I think I was lucky with the reliability of both my flights taking off on time as this was the one thing I was worried about! The seats are very dirty (front seat pocket) but all airlines are usually quite unhygienic so this was to be expected. The service on board I thought was great, very friendly staff and attentive. Overall I would say you get what you pay for and you are taking a risk booking with WOW air, but lucky for me I had a good experience with them and would book again! 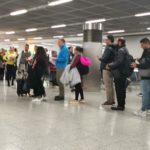 "fly a more reliable airline"
Not Verified | We had booked the Wowair stopover Detroit to Barcelona via Keflavik and just shy of 2 weeks prior to our vacation (family of 5), we received a text and email from Wowair saying they had cancelled our BCN stopover. Because we had already scheduled time off work and school and hotels, cars, meeting others in Barcelona, we were forced to buy connections on Air France. WOW said they could get us as Paris so we had to purchase 5 round air tickets from CDG to BCN, lost 2 days of our vacation, lost a night in a hotel in BCN, had to pay for a hotel at CDG, spent almost 2 full days dealing with connections, layovers (extra costs for food, car etc) Then several days before our DTW to KEF flight, WOW air changed our airplane and scattered us all over the airplane (kids in middle seats in back etc). We were one of the first to book on the flight (Was empty at time) and had paid to purchase upgraded seats together/seats together. Wow did not honor seat assignments. spent close to 2 days on phone / email / twitter support with Wowair and AirFrance and hotels/car rental scheduling, rescheduling, getting seat assignments, seeking compensation. Wow cites an EU regulation that if cancel 2 weeks before, will offer no compensation; they slipped in just before 2 week window with cancelled flights. The staff was very nice but the company is just horrible. We were out approximately $2000 all in and no compensation or accommodation from company. Very sad because this was a long planned family trip that we had saved for and planned for a long time. The day we were flying, the company was offering "free flights to people with the last name Valentine". Very gimmicky and not taking care of their paying customers. Lastly, truly the most uncomfortable flight we have ever been on. It is a discount airline but so this is to be expected (though not at all discount when they screw you and cancel your flight). The economy / no upgrade seats are the most uncomfortable you could imagine, people were very miserable. Many families, could not move around at all. The first three rows were very large, like the people could do a pike/legs straight out. Makes no sense to give the upgraded seats too much room while the other 30 rows really suffered. The flights were packed and a lot of unhappy people. They charge for even water so the by the time you pay for water, food, definitely consider an upgrade, charges for luggage and if you are really unlucky - cancellation fees - you could fly first class with a reputable airline. Iceland is lovely but fly Delta or United or partners or anyone but Wowair. I read many many complaints on the internet etc. that they did this same behavior to many many other people. Company really does not deserve your hard earned vacation dollars. I would urge you to fly a more reliable airline. "I hope they go bankrupt"
✅ Trip Verified | Boston to Keflavik. If they had zeros, I’d give it to them. I don’t care how cheap it is, it was NOT worth the pain and suffering my mom and I went through on their airline. Our flight was completely cancelled by WOW Air 3 weeks before our trip. They offered to fy us out of Boston but offered no compensation and we still paid the same price as we would’ve if we left from LA. Their costumer service is horrible! They block emergency exits with their food cart and even sat a 10 year old in the exit row. Unbelievable! I hope they go bankrupt so no one has to make a mistake and travel with this disgusting excuse for an airline! "cheap price and direct flight"
✅ Trip Verified | I flew with a friend to Iceland from Toronto for a 4 day trip. We were attracted to wow air because of the cheap price and direct flight to Keflavík international airport near Reykjavík. It is important to note for travellers that you do have to pay for a carry on bag and pay for a checked bag, so my friend and I packed our checked luggage together and split the cost, however, make sure to pay attention to the weight. The website advertises that it needs to be 20kg and as long as we were under 21kg the attendant was fine with our bag. On the flight itself, there is a decent amount of space for a backpack under the seat in front and for the price you’re paying, it’s great. I was blown away by the customer service on the flight there. I am a very nauseous flyer typically, I get motion sickness on any moving vessel. I took a different type of gravol than normal and needless to say ended up vomiting 4 times on the 5.5 hour flight. After the 2nd time I vomited, they offered to move me up to premium class but I declined. After the 3rd time they offered again to move me where I had more space to be comfortable and where there would be less intense turbulence. They were so attentive and kept checking up on me to make sure I was okay. They offered me cups of ice continuously and ginger ale and made su. ✅ Trip Verified | Toronto to Keflavik. We had a great experience. The service was exactly as described when booking the ticket. The crew members were amazing, I have no complaints. They left on time both flights and the return flight arrived 40 min earlier. I bought the promotional tickets to visit Iceland. Overall 5/5 stars and I would recommend this airline.